Mike Morales and Alex Perez taste and discuss Cabo Wabo Reposado Tequila, nominating it for the 2014 Brands of Promise Awards. Cabo Wabo Tequila was born in 1996 on the backroads of Guadalajara by legendary musician andtequila aficionado, Sammy Hagar. After searching for atequila exceptional enough to serve inside his cantinain Cabo San Lucas, Sammy partnered with a tequila-making family with over 80 years of experience. Today,the agave used to make Cabo Wabo Tequila is grown,cultivated and harvested by this same family. Recognized as one of the finest tequilas in the world, this Reposado delivers a distinctive experience that even the most discerning drinkers find delightful and unique. An assertive nose of sweet lime, orange and fresh herbs excites upon pouring. Maturation in American oak casks for 4 to 6 months infuses our Reposado with a bold peppery flavor and hints of fruit that linger on the palate briefly, followed by a long, spicy finish. A truly incomparable spirit, Cabo Wabo Tequila Reposado is ideal for sipping solo or in a top-shelf margarita or other mixed drinks. 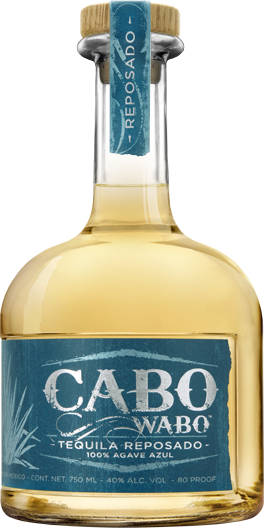 Cabo Wabo Tequila “Still a great tequila”. Visit Cabo Wabo Tequila’s website for more information on the tequila and the lifestyle.